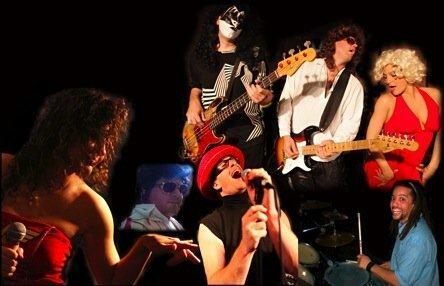 It’s a cover song dance band and a tribute band all wrapped up in one. Members show up as different artists like Gene Simmons from KISS, Slash from Guns and Roses, Madonna, Devo, Tina Turner, Elton John, the Beatles and more. it delivers the hits from every generation, and they only play the chart toppers. Get your crowd ready to dance because Sellout band kc is all about packing the dance floor. You get the visuals and the fun of a tribute band, but instead of just playing one band’s music. Sellout plays it all!. Gaining popularity as a prominent KC band Sellout has migrated several miles from their roots. At the Lake of the Ozarks to some of Kansas City’s hottest dance clubs. it was a big hit at least year’s JAZZOO. Packing in fans by the thousands. These guys will turn heads for sure.